Following the decision to head out the next day, the dwarf oddly did not partake of the drink and festivities. Instead, he spent his evening sharpening his axe blade as well as those weapons found in the Sukiskyn armoury. They would be battle ready should there be need of them. As the evening had progressed, Ludo reflected while he sipped on his ale, which was the strongest he had drunk. It was good to be able to have a chance to rest, the travels had been tiring. He contemplated the plan, it seemed good and would in all likelihood make Golthar’s job all the more harder. It would be difficult to ambush them in Hasan’s backyard. The rogue observed Stephen laughing with his brother and extended family. There is a lucky man—family to look after and family to watch your back, Ludo thought to himself. He envied Stephen at that moment. Moving outside, he toured around the compound greeting each guard in turn, before he retired for the evening, the day had been long and the ale had taken its toll on him. The very drunk Pyotr hugged his younger sibling, and then proclaimed the group to be his greatest friends and embraced each of them with a mighty Traladaran hug. His wife Darya then helped the elder Sukiska to bed. And, with that, the last of the revelers rested for the night, as the dwarf stayed up late into the night keeping watch along with those already assigned to guard duty. “What is his name? Perhaps our paths have crossed?” Kuzma asked. “My Abbot now resides beside the Avatars of Mighty Halav awaiting his triumphant return. For He is with us, but He is subtle and only us blessed few know the truth. For he sits and abibes his time within the body of Duke Stefan. It is not yet time for him to reveal himself. But when that day comes we must be prepared. We must be pure.” Maruc grinned. “I see by your face you find difficulty with this, but fear not. I do not evangelize. I ask only that you do as you have always done. Hold Halav close, and he will reveal his thoughts to you.” Maruc thought for a while. The old priestly woman had at first been skeptical of Maruc. She knew of his church and its reputation—it was referred to as the Cult of Halav, afterall. However, having witnessed firsthand the actions of the group and its priest in particular, she was more than willing to grant Maruc his requests. She was reticent to receive payment, but when Maruc impressed upon her that they had garnered treasure from Golthar’s tower, she relented. Stephan gratefully took from the stores of Sukiskyn: hard tack, encrusted cheese, extra water skins, quinoa and dried fruits. Having left a fair share of his portion of the take from Golthar’s tower, he knew that his family would have no trouble refreshing their stocks. In fact, if the promise of what the map had revealed to him came true, the family would never have want for wealth again. Miklos helped himself to the stores of dried fruits and an particularly piquant cheese round. he took some flat breads and a wonderfully tender molasses smoked ham. The Sukiskyn clan didn’t seem to mind. He finished off with a good bowlful of pearl barley and split peas in a stew Kuzma had prepared. The previous evening Miklos had thought long and hard about what the future would hold and how best to prepare. Worst case was that they were going to be attacked out in the road somewhere or on the river. Therefore, an aggressive selection of magic was called for for attack was normally the best form of defense. He decided that his current selection was most appropriate and spent some time revising his magic for the forthcoming journey. He checked his armor and clothing, again accepting from his Sukiskyn brethren new trousers and jerkin to wear under his armor. He also took a new quiver to hold his arrows as well as several new arrows to accompany his two enhanced ones. With the help of Stellios, he was able to patch up his boots. “You sure you don’t want this new pair here, Stephan. They’re hardly worn.” The old man held the boots in his one hand. Once his gear was ready, Stephan assisted the others with gathering food and other supplies. In doing so, he spied a good new length of rope and added it to his pack. Feldard took only the barest of rations that he would need – mainly dried beans, dried fruits, hard tack and clapbread. He refilled his wineskins with wine, since he drank that less liberally than he did ale. There was no point in his attempting to find other clothing here. Nothing in this place would fit him without major alterations which he did not have time for so he made do with the stained and torn clothes he had on him. Feldard hated to make the request for any of the clan’s small store of crossbow bolts but given the fact that his own now were all in need of repair he couldn’t just pass on the opportunity to stock up on even just a few. Once again, the Sukiskyn clan were beyond generous with him. Ludo too had wandered over to the Sukiskyn stores and filled his backpack with what supplies he figured he would need. Salted beef, nuts, dried fruit, a new canteen and some extra arrows. As he poked around, Darya came over and presented Ludo with a dark green wool cloak. “Ludo take this, it will help to keep you warm at night”. Ludo muttered his thanks, but was at a loss to fully give his thanks and gratitude for her gift. The dwarf stood stoutly in the main hall as the group gathered to say their farewells. These folk were good people. “Pyotr, may your house stand firm against any who wish your family harm. Darya – May your hearth fire always burn steady and your larder never empty.” He gave a bit of a gruff nod and looked to the others – ready to leave. He then assembled with his mates in the main hall, preparing to depart. Hasan thanked the clan. The elf had been ready the first time the bird awakened, but it seemed his companions were reluctant to leave or were troubled rising after the celebratory night. But the elf’s energy was very high. The Radlebb! They were headed back to his home forest on the morrow, Stephan had said. The elf’s feet nearly leaped off the ground with each step, as the party bade farewell and turned their backs on the foresters. The sun was barely breaking through the trees. Darya assured that the travelers had a full belly before heading out. Pyotr was up and lively despite his condition the night before. He appraised his younger brother’s gear then looked closely in his eyes. As the party gathered, a light rain began to fall. The whole of Sukiskyn gathered to wish them well. After wishing everyone well, Ludo hefted his pack onto his back and went and stood by Miklos, it was time to move on. 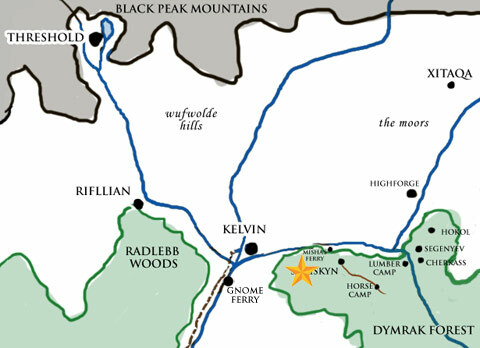 Rifllian was located at the northern edge of the Radlebb. To get to it, the group would have to cross the mighty Volaga River. They were limited in their options. Stephan knew of a ferry crossing operated by the gnomes that would seem to be their best option. As they made their way through the Dymrak, Hasan’s finely honed elven senses told them that they were being followed. I thought it likely that Stephan would leave a large portion of his take with his family to help them rebuild. You all still have plenty of cash though obviously! Maruc almost walked into Hasan when he stopped and held up his hand for silence. “What is it?” he asked. The tall elf waved him into silence. Sencing something was wrong. Maruc freed his chain flailed and eased his hand into the punch grip of his shield. He looped the sheild strap over his head and motioned Miklos behind him. “Too soon for that I think. Now be silent.” the priest said through gritted teeth. “Time for an ambush. Pehaps?” Miklos darted over to Ludo. “Ludo. Golthars agents are on to us I think. Can you get a closer look?” he whispered. Quickly nodding to Miklos in agreement, Ludo darts off the trail into the undergrowth. Using the pine forest and natural foliage as concealment backtracks around the stranger who is following them and then attempts to move in behind whoever is following them. Ludo was worried, where was the spy? He heard the sharp sound of a twig crack off to right about 30 feet away. Ludo paused in mid step and then gently placed his foot down and then slowly crouched down. He recalled the teachings of his fathers gamekeeper, ‘no sudden movement – in a forest when hunting move slow and silently and keep down wind wherever possible’. He was using all his skills to sneak up on a foe that was in all likelyhood expecting trouble and it felt like that every movement and every breath was giving his position away. Anticpating that the spy was close, he drew his dagger from his belt and slowly moved to the right where he had heard the twig break. DM – Ludo will use ‘Hide in Shadows’, ‘Move Silently’ and ‘Hear Noise’ skills to try and sneak up on the stranger. If Ludo is successful he will move in to engage the stranger in combat and will attempt to subdue him.